Millions of African soldiers, labourers and carriers participated in the First World War on the African continent and on the Western Front in Europe. Artist John Akomfrah has created a new installation to commemorate those Africans who fought, served and died during the war. Mimesis: African Soldier was on display at IWM London from September 21st 2018 until 31 March 2019 as part of Making a New World, a season of exhibitions, installations and experiences exploring how the First World War has shaped the society we live in today. The work is projected onto three screens and blends archive material and newly shot film recorded in locations around the world, highlighting the contributions made by Africans – and honouring the sacrifices they made. The work was seen for the first time by visitors to IWM London. When the museum was founded in 1917, it was originally intended it would be known as the National War Museum. But its name was changed to Imperial War Museum so 'India and the Dominions would feel that their part in the War would be permanently commemorated in the centre of the Empire'. Although the Empire has since dissolved and the world has changed significantly, the museum still collects and displays material that tells the story of the war by those who experienced it and Akomfrah says he is ‘happy’ his work is going to be shown in the museum. However, he believes that once the work is out in the world, it is the audience who will determine what happens next. ‘My wish is that it would be a kind of sensational encounter that people are moved, that they find it illuminating that they learned something, all the rest of it…. I have to bring the work and a viewer together. And from that point on, my job is done. Mimesis: African Soldier is co‐commissioned by New Art Exchange, Nottingham, Smoking Dogs Films and 14‐18 NOW, the UK’s arts programme for the First World War centenary. In 1915 Britain's War Office, which had initially opposed recruitment of West Indian troops, agreed to accept volunteers from the West Indies. A new regiment was formed, the British West Indies Regiment (BWIR), which served in Europe, the Middle East and Africa. 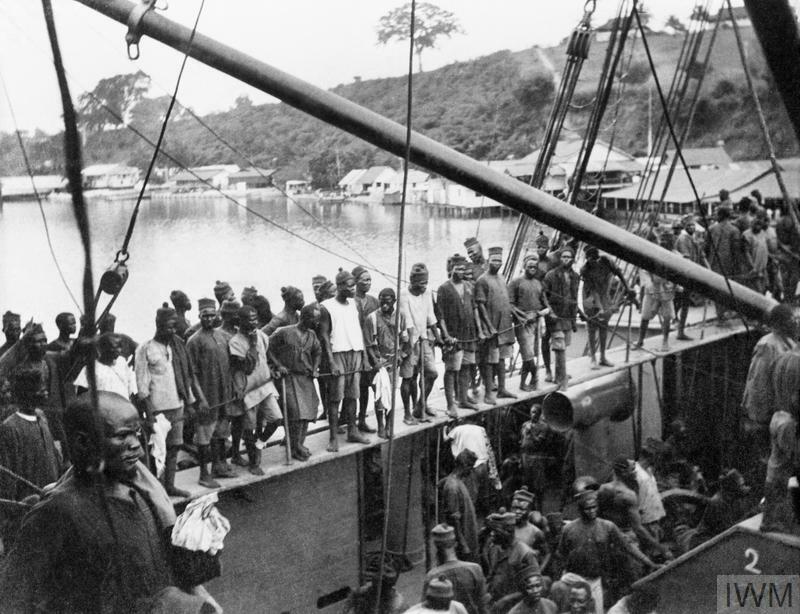 On the night of 21 February 1917, more than 600 men of the South African Native Labour Corps (SANLC) lost their lives in the sinking of the SS Mendi- the largest single loss of life for the non-combatants in the SANLC during the First World War.